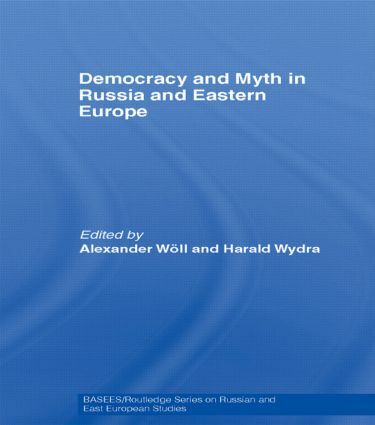 In the absence of democratic state institutions, eastern European countries were considered to possess only myths of democracy. Working on the premise that democracy is not only an institutional arrangement but also a civilisational project, this book argues that mythical narratives help understanding the emergence of democracy without ‘democrats’. Examining different national traditions as well as pre-communist and communist narratives, myths are seen as politically fabricated ‘programmes of truth’ that form and sustain the political imagination. Appearing as cultural, literary, or historical resources, myths amount to ideology in narrative form, which actors use in political struggles for the sake of achieving social compliance and loyalty with the authority of new political forms. Drawing on a wide range of case studies including Ukraine, Russia, Poland, Hungary, and Czechoslovakia, this book argues that narratives about the past are not simply ‘legacies’ of former regimes but have actively shaped representations and meanings of democracy in the region. Taking different theoretical and methodological approaches, the power of myth is explored for issues such as leadership, collective identity-formation, literary representation of heroic figures, cultural symbolism in performative art as well as on the constitution of legitimacy and civic identity in post-communist democracies.